Saskatchewan Avenue is a regional street in the City’s North West Quadrant crossing Sturgeon Creek over a box culvert. The box culvert has been found to be hydraulically deficient to handle Sturgeon Creek flows in spring run-off and heavy rain event conditions. Between Cavalier Street and Hamilton Avenue the road is in fair to poor condition. Construction is underway to replace the culvert with a high-level bridge, and to re-construct of the road. Bridge construction over Sturgeon Creek and roadway reconstruction and rehabilitation of Saskatchewan Avenue between Cavalier Road and Hamilton Avenue is now complete, Saskatchewan Avenue has been open to vehicular traffic since late October 2018, with site cleanup works completed in late November 2018. Multi-use pathway construction along Saskatchewan Avenue followed by landscaping works will be completed in the Spring of 2019. Bridge construction over Sturgeon Creek and roadway reconstruction and rehabilitation of Saskatchewan Avenue between Cavalier Road and Hamilton Avenue is now complete, with site cleanup works to be completed by early November 2018, and multi-use pathway construction along Saskatchewan Avenue followed by landscaping works to be completed in the Spring of 2019. Saskatchewan Avenue is now open to vehicular traffic. Road reconstruction, road rehabilitation and land drainage modifications adjacent to the ongoing bridge work on Saskatchewan Avenue at Sturgeon Creek will begin on Monday, May 14, 2018 and will take approximately 24 weeks to complete. In order to complete this work, Saskatchewan Avenue between Cavalier Drive and Hamilton Drive will be closed to public traffic until fall 2018. A letter to residents in the immediate vicinity and affected by the work is being delivered prior to start of construction. Another update will be provided once the work is complete. 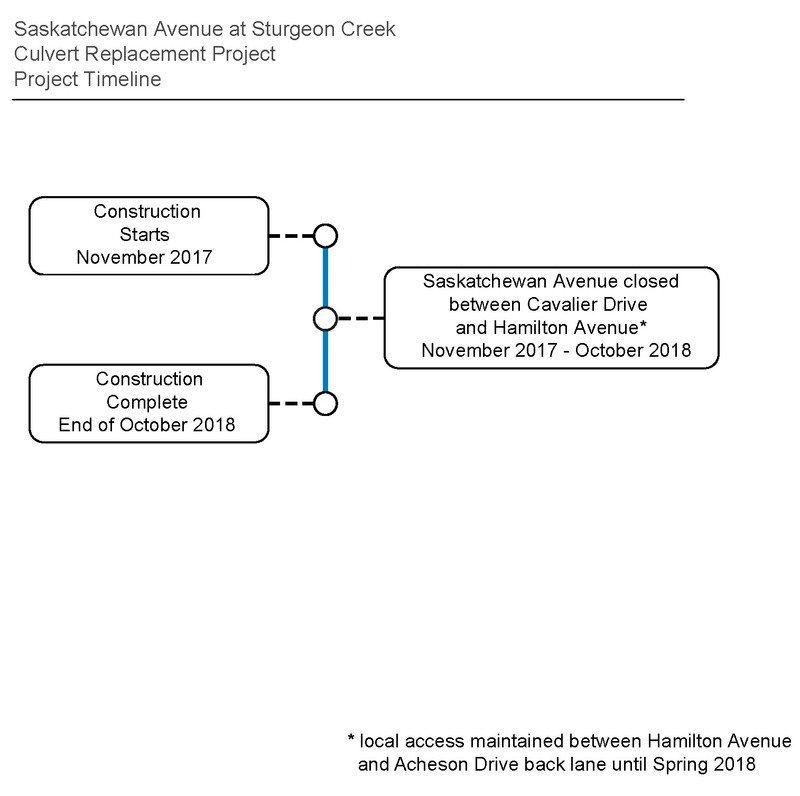 On November 26, 2017 Saskatchewan Avenue from Cavalier Drive to Hamilton Avenue will be completely closed to both eastbound and westbound traffic for the construction of the new Saskatchewan Avenue Bridge over Sturgeon Creek and Saskatchewan Avenue roadway reconstruction and rehabilitation between Cavalier Street and Hamilton Avenue. Saskatchewan Avenue will remain closed for about a year while the project is underway, until October 31, 2018. Pedestrian access will be not be maintained. Motorists should allow additional time to get to their destinations, and use alternate routes. Please see the construction notice brochure for additional information. A hydrogeological study is underway, and next steps include detailed design for road reconstruction and culvert replacement. In 1962, a two-cell concrete box culvert with concrete sloped wing walls was constructed to provide adequate flow of Sturgeon Creek under Saskatchewan Avenue. The aging culvert is considered to be in fair to poor condition with concrete deterioration and severe scour damage on the downstream wing walls and creek. It is also hydraulically deficient, as overtopping of the road has occurred on several occasions in the past. At this location, Saskatchewan Avenue has two traffic lanes and no sidewalk. A study was completed which included a hydraulic investigation and analysis of Sturgeon Creek to determine the size and type of the hydraulic opening, geotechnical investigations and analyses of its banks and the roadway, and development of structure replacement and road reconstruction concepts. The public provided feedback during this phase of the project. A preferred alternative was selected which includes realignment of Saskatchewan Avenue to the South at the bridge location, and construction of a three-span bridge over Sturgeon Creek. The primary objective of the project is improve the flow of Sturgeon Creek, prevent Saskatchewan Avenue from flooding and improve its road condition, and at the same time possibly expanding the City’s multi-use path network which has not yet been confirmed. The community appreciated the opportunity to learn about the project. The proposed pedestrian and cycling pathways were well supported and the public thought the proposed pathways could improve safety for pedestrians and cyclists. Those who provided input were interested in more pedestrian and cycling connections in the area. What impacts are expected during bridge and road construction? The City will work to mitigate construction impacts as much as possible. During the bridge and road construction work, the primary impact will be the temporary road closure of Saskatchewan Avenue between Cavalier Drive and Hamilton Avenue. Residents should expect increased vehicular traffic on Hamilton Avenue and some residential streets due to re-routing of traffic. For more information see November construction notice. When will construction begin? And how long will construction take? Construction is underway for a period of one year. The construction vehicles will use Saskatchewan Avenue. As part of the project the City will possibly be expanding the City’s multi-use path network which has not yet been confirmed. What will be done to protect environmentally sensitive areas and Sturgeon Creek? Best management practices for working near waterways that include the appropriate implementation of soil erosion control measures will be followed. Exposed slopes not covered with rock will be revegetated. Riverbank will be a naturalized area to the extent that it currently is and maybe expanded where revegetation is needed. Construction activity will not occur between April 1 and June 15 in any year in the creek. Construction will occur in late fall and winter period when water levels are lowest and the potential for runoff is reduced and thereby minimizing water management requirements. Heavy rainfall causing flooding and high Sturgeon Creek exit velocity out of Saskatchewan Ave. culvert. Heavy rainfall creating whirlpool effect in Sturgeon Creek between the CN Rail Bridge and Saskatchewan Ave. culvert.